Hydroelectric power provides 50% of the total electricity generated throughout Latin America. By comparison, the world average is only 16%. Thermal power generation, which includes the use of natural gas, fuel, and coal, accounts for 47%. Meanwhile, alternative resources account for only 3%, and this is where the bulk of future investments will focus, according to the Inter -American Development Bank (IDB). 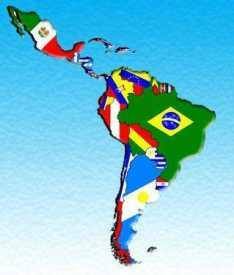 Latin America has been experiencing a substantial increase in demand for energy in recent years, and between 2002 and 2012, the region increased its electricity consumption by 51%, according to the latest data published by the Energy Information Administration (EIA) . During this same period, Guatemala and Paraguay doubled their consumption, but not their energy generation. This trend will continue, as most Latin American countries have increased their energy consumption by nearly 5% on average between 2014 and 2017, according to a study published by the Commission for Regional Energy Integration (CIER). 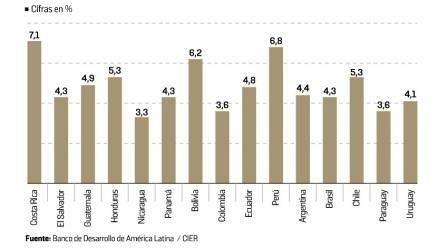 Peru, Costa Rica and Bolivia are the countries that have the highest increase of electricity consumption. The forecast is that the demand will increase to 3,000 terawatt hours in the region by 2050, compared to the current figure of 1,234 terawatt, according to the World Energy Council (WEC). Due to the expected demand, a large investment will be needed for new generation in the larger countries such as Mexico, Colombia, and Brazil. They currently have plans to increase their installed capacity, and also to reduce their cost of energy. This is especially important for the Mexican market, which has the most expensive cost per kilowatt hour in Latin America (see Figure 2). This is a huge burden for the Mexican manufacturers and producers because they need to compete for business with the USA. North American power companies are the most competitive, with some of the lowest costs worldwide, thanks to the development of new and cleaner resources. This competitive advantage has awakened all alarms worldwide and has sparked the demand for the imposition of new tariffs on many US products by several European countries. Latin America has the advantage of many clean and renewable energy resources and these countries are less dependent on oil imports. This factor is of great importance, as there is a global consensus on the importance of reducing carbon emissions and the need to decarbonize the energy sector, which is the second largest emitter of carbon after the transportation sector. Because the Latin American countries have strong water resources, they are developing hydroelectric power plants that provide cleaner energy, and the region has developed only about 30% of its hydroelectric capacity. Brazil’s huge water resources allow it to be the country with the most potential for generating hydroelectricity, followed by Colombia, Peru, and Venezuela. Columbia has been suffering its worst drought crisis in 40 years, and this has caused water reservoir levels to fall below useful levels. Therefore, the country will need to increase other resources for electricity generation and this is causing consumer costs to increase. Electricity consumption in Colombia grew 4.4% last year over the previous year, the highest growth in demand over the past decade, placing it at 63,571-gigawatt hours, according to data from XM, an ISA subsidiary. Most of the electrical energy produced in Colombia comes from hydroelectric plants; 69% in October 2014, according to data from the Energy Mining Planning Unit (UPME). Presently, gas generating plants are producing 25% of Columbia’s electricity. Meanwhile, Argentina has a shortage of existing power generation and for the last decade this has kept prices stable but has not helped to encourage investments in new power and cleaner generation resources. In Mexico, the process of energy reform in the electricity sector has involved private companies that are seizing opportunities to participate in proposals for the construction of generation plants and transmission lines. As outlined by the Mexican government, the entry of private capital has opened the door to increased competition and lower consumer electricity costs. The goal is to have more operators that will be forced to drop their prices to gain market share. Currently, Mexico’s electricity costs for the commercial sector are 73% higher than in the USA, and this high cost of electricity is one of the main reasons that Mexico’s industrial productivity has decreased. Mexico’s government applied subsidies for residential electricity per kilowatt-hour consumed, creating distortions in the actual costs, because 10% of the population with the highest income (which usually consumes more energy) received more than twice the per capita subsidies than lower income consumers. For this reason, the Mexican government passed a new energy law and began to regulate prices and maintain subsidies for all consumers. According to the Federal Electricity Commission (CFE), reductions in the cost of electricity will begin to be felt over a period of two years, when it can replace fuel oil, coal-fired, and geothermal power plants with cleaner hydroelectric and wind-powered resources, thereby reducing losses in transmission and distribution. Mexico’s new electricity law prohibits any single company from participating in: generation, transmission, distribution and marketing of electricity in the country. However, a parent company can participate in these activities as long as it does through independent subsidiaries. An additional advantage of the new law is the creation of the National Center for Energy Control (CENACE). a public entity which began operating in 2016 in order to manage the operational control of the national energy system as well as the wholesale market. Mexico is not the only Latin American country with a new energy law. On September 14, 2015, Costa Rica’s government passed a new National Energy Plan that allows for all national citizens and legal residents to supplement their own electrical consumption, by installing and operating distributed generation systems, using renewable energy sources, of solar, wind, water, or biomass. The concept of Distributed Generation is that individuals can generate their own electricity and make a connection with one of the electric distribution companies so that the customers can replace some of the electricity that would normally be taken from the national distribution network. You can read the full article about this here: Costa Rica’s New National Energy Plan. The writer, Tom Rosenberger has lived and worked in Latin America since 1993 and from his travels throughout the region, he has acquired a wealth of knowledge about living and doing business in Costa Rica. If you have questions and would like to contact Tom click here.